Squirrels might seem cute and cuddly, but once they decide to call your attic home, you’ve got a problem. Squirrels often move into attics to give birth and raise their young, mother squirrels can be particularly ornery if they feel their pups are threatened. Once inside, squirrels leave behind a pungent odor from urine and feces. Squirrel waste is a source of disease to humans and pets, additionally it is also harmful to buildings, breaking down structures by rotting wood and other organic building materials. Once squirrels have found their way inside they often provide entry to other unwanted guests that cause further damage inside the structure. Without exaggeration, squirrels are quite possibly the single most destructive animal to a building. They are capable of chewing through thick walls to gain entry and causing severe, costly cosmetic and structural damage. 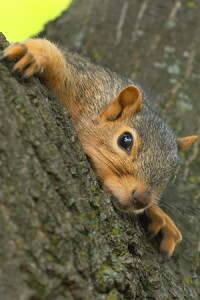 If you are facing a squirrel infestation in your home or business you need a professional. Our technicians are experts at squirrel removal. We can safely and humanely remove and relocate the squirrels, we can perform any necessary repairs and install exclusion methods to prevent future squirrel infestations. Below is a sequence of pictures depicting squirrel damage and repair to the interior wall of a home.